Bushnell 713959I Banner 3-9x50 IR Reticle Riflescope 713959I FREE SHIPPING! This Bushnell Banner variable power riflescope is designed for superior medium-range performance in low light conditions. It features an advanced Dawn & Dusk Brightness multi-coating that is specially formulated to provide enhanced visibility in the early morning and late evening, extending your operational window. The scope's fast-focus eyepiece and resettable fingertip windage and elevation controls allow you to engage your target with speed and precision. The one-piece scope tube is built to withstand recoil shocks. It is also O-ring sealed and filled with nitrogen gas to keep out water and prevent it from fogging in cold conditions. 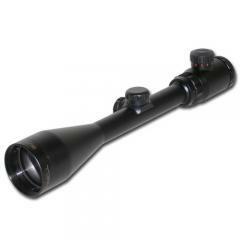 ©2002-2019 CopsPlus.com: Bushnell 713959I Banner 3-9x50 IR Reticle Riflescope 713959I FREE SHIPPING!